This is an amazing game with various levels that take regular worm races to the next level. Yes you have to get from Point A to Point B but watch out for the pillars of death and the elastic bands of resistance. 2. Resistance Bands / Bungee Cords. These will be stretched across the playing field to hold players up from moving as fast as they want. 3. Pillars. Anything that is big that can fall over if you make contact with it will do here. 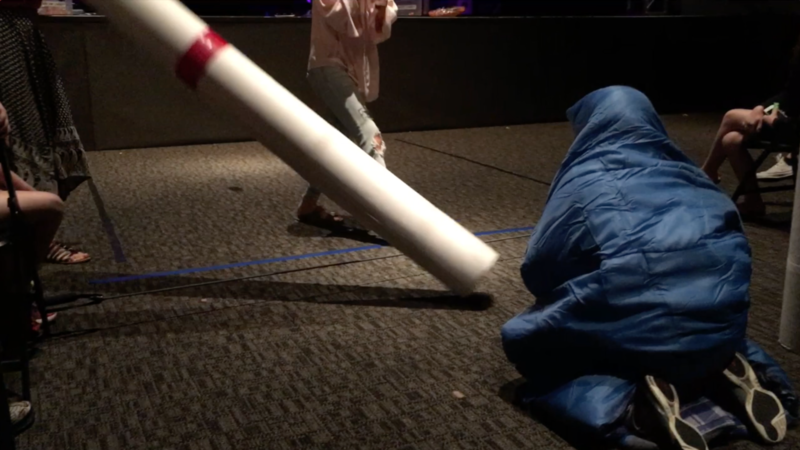 We used old carpet tubes to make bowling pins but repurposed them for this game. Use the resistance bands and attach them to chairs set on the outside of the playing area. Tape a starting line and a finish line. This works just like regular worm races. 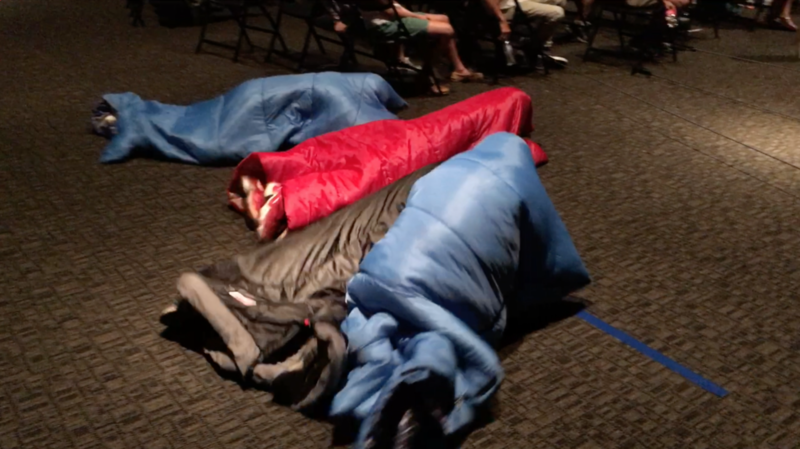 Contestants must enter head first into the sleeping bag. Line all contestants up while they are in their sleeping bags at the starting line. 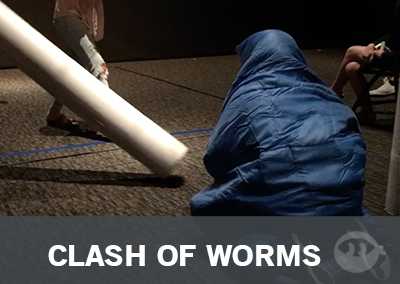 On your go all contestants must work their way toward the finish line inching their way like inch worms. As they run into a resistance band that is fine as it might just slow them down BUT if they run into and knock over any pins then that contestant is now out. (Note: Make sure to set up one less pin than you have contestants. The potential for all pins to drop means that the sole contestant who has not hit a pin becomes the winner. This is a great game for both the contestants and the crowd as they watch in anticipation to see if someone will knock over a pin! We played this game at our annual all-nighter. It was amazing. 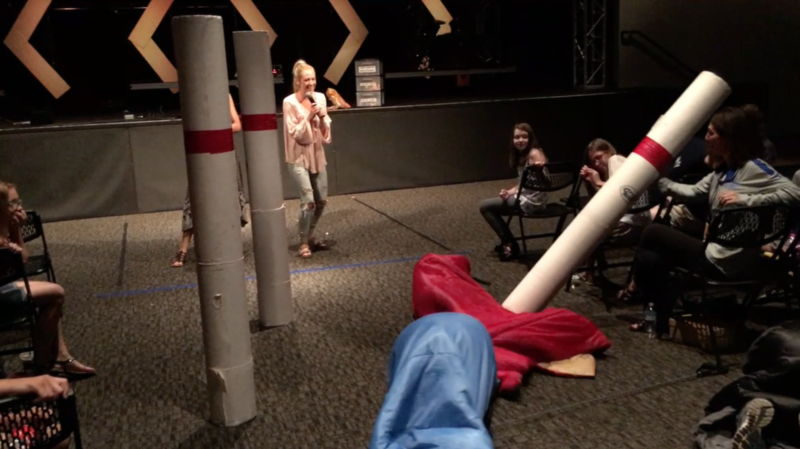 Even though I was not able to set up the obstacles, it was a huge hit. I recommend at least the bungees to slow it down or it does go too fast. And the hype dance music made it much more exciting. Definitely a winner! Thank you!